This is part two of our four part series: Pipedrive's Big Sales Interview. 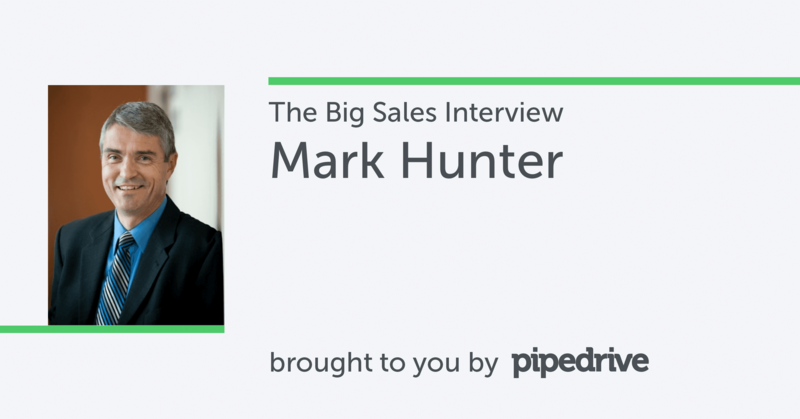 Mark Hunter is more than a sales trainer; he is a sales evangelist. Hunter, known in the sales training world as The Sales Hunter, truly loves selling. He gives high-energy talks about connecting with customers, speaks lovingly of prospecting, and every week releases short videos intended to help struggling salespeople become top performers. Selling at a discount is anathema to him. Hunter believes that all salespeople can close deals at full price — if they are passionate about the relationships that they create with their prospects and serving the needs of their customers. Hunter is the second subject of Pipedrive’s Big Sales Interviews, a series of in-depth discussions with thought leaders in the sales industry. The Big Sales Interview goes beyond each thought leader’s latest book or sales philosophy; it even goes beyond sales. We ask each expert about their personal history in the sales industry, the mistakes they’ve made, and even their favorite sales books. Hunter talked to us about why he stuck with sales, why he equates salespeople with leadership, the advice he would give to a struggling salesperson and more. I got into sales because of the Seattle Police Department; I got three tickets in my last quarter in college. As a result, a few months later, I couldn't afford car insurance. I needed a job that supplied me with a company car. That is how I wound up in sales. What I learned in sales — and it took me a few years — is that sales is all about a one-to-one relationship, connecting with the individual. I had gone to college to get a degree in marketing. I was going to go into advertising, you know, mass messaging. Now, I suddenly had to shift from mass messaging to one-to-one messaging: creating a relationship, finding the need, and helping to sell that need. When did you first own the label of “salesperson,” and what makes you proud to sell professionally? I was probably in sales four or five years before I really grasped what sales was about. Again, I was taking a marketing advertising approach to sales. I didn't wake up one morning and say, "Wow, I suddenly embrace sales." I had a boss tell me, "You'll never connect with your customers until you truly understand from a personal standpoint who they are." That made a huge impact: it was no longer business, it was now personal. A salesperson is a person who helps others see and achieve what they didn't think was possible. Many times, a customer can't define their intended outcome. We come in with expertise and help them see and achieve what they didn't think was possible. If you stop and think about that, that's the same definition of a leader. You see, a great salesperson is a great leader. A great leader is a great salesperson. If you had to start your career over again, what one thing would you do differently now? I would listen to my peers more. They told me to shut up and listen to the customer; take the time to ask the questions. Let the customers take control of the process and they'll guide you to the solution they're looking for. I vividly remember several senior salespeople sharing that concept with me and I didn't understand it. It took me years to get that. How did you develop the core sales philosophies you teach as The Sales Hunter, your “difference maker”? I’ve really focused on helping people close deals without discounting. I began to see a lot of discounting probably about 10 or 15 years ago, and it has just continued to evolve. It became a real problem during the recession; everybody was discounting. That's when the message really began to hit home. People began to realize that you can't discount your way to prosperity. My first book was High-Profit Selling, but I found that salespeople were still discounting, because they were starting off with the wrong prospects. That's what caused me to write my second book, High-Profit Prospecting. When you find the right prospects, you can close them at full price. The example I use, and I use this a lot, is you can't take a Walmart shopper and make them a Nordstrom customer. It's just not going to happen. Start with the right prospect and you can close them at full price. That really became my mission. What would you say your greatest accomplishment in sales to date is? What I'm proud of right now is the numerous salespeople who said they were ready to hang it up and quit sales, but they read my material and they've been able to turn their career around. My greatest success is when I hear success stories like that from individuals. That's greater than any single sale, any single transaction. I've had plenty of big, big sales, but when you can make a difference with an individual, then you say, "You know what? What I'm doing is worthwhile." The biggest skill is really leadership and communication. I use that every day of my life. The ability to listen to people and accept them where they are. Great salespeople don't assume anything. They accept. What I mean is they accept what the customer shares with them. They probe deep. It's the questions they ask, not the statements they make. Integrity. The sales industry is still very misperceived. We need to, as an industry, demonstrate a much higher level of integrity with our customers, and with everybody we come in contact with. I tell salespeople, 'Your job with each person you meet, whether it be a customer, whether it be a barista, whether it be a clerk at a grocery store, waitstaff at a restaurant, your number one objective is to earn the right, the privilege, honor, and respect to be able to meet with that person again.' Think about that. If you do that, that's pretty commendable. If you do that, you'll be successful. How long did it take you not to care if prospects say no to you, or avoid giving you an answer? Oh, wow. That took years. Unfortunately, I'm a slow learner, so it probably took me 10 years in sales before I got over that. There are still some no’s that hurt, but you move on. I think a lot of reps might believe that the sales superstars are immune to that fear of rejection. No, they're not immune. People will say, "Oh, you can pick up the phone and call anybody." Yeah, you're right. I'll call anybody, but believe me, there are some prospects that make me stop and think, "Hold it. I’ve got to think this through. I’ve got to really think through what I'm going to say." I don’t care who you are, we all put our pants on one leg at a time and sales is an emotional game, an emotional business. What's the most misguided philosophy or practice in sales today? Thinking it's about price. It's not about price, it's about value. Price is a reflection of the value the customer perceives. Increase the value, and you can increase the price. I run into a lot of salespeople who tell me, "Our prices are way too high. We need to reduce them." I used to do this all the time. I used to say, "If we could just lower our price, I know we could close a lot more deals." Salespeople are never willing to say it's their ineptness when it comes to selling that's causing the sale to not close. Salespeople will always blame something else. It’s always price, price, price. It's not up to us as salespeople to determine what our prices are. It's up to our customers to perceive what our products are worth. Let me give you an example: two people are on the same flight. One person might be going to see a friend, so they'll be willing to pay $300 for that ticket, but the business person who is going to close a $20 million deal will pay up to $2,000 for that same ticket. There's nothing wrong with different price points. How can salespeople move to a value mindset? You move to the value by getting rid of your presentation and just asking your prospect more questions. The more questions I ask, the more information I'm going to find. The more information I find, the more paths I can go down with a customer. One of those paths will be the one that ultimately leads me to a much higher value outcome than maybe even what I was expecting as a salesperson. The customer will see they’ve got a critical need and thus, they will buy. Any advice for struggling salespeople? One, make your first two calls every morning to your favorite customers. Let them cheer you up. They'll tell you why they like doing business with you. Somehow that just really motivates you. Two, find a sales peer who is really, really good and allow yourself to be accountable to them. Those are the two single pieces of advice I tell new or struggling salespeople. What book do you think that everyone in sales should read and why? The go-to book that I like is "New Sales Simplified," by Mike Weinberg. He is cynical with regards to sales and blows apart many of the traditional myths as to why we can't do something. Salespeople are quick to create obstacles. The biggest obstacle a salesperson has to overcome is in their own mind, not with a customer: "I can't call that person. I can't talk to them. I can't do that." Just pick up the phone and do it. Recently, you wrote that the future of sales is bright and you've never been more proud of the sales profession. Why do you feel that way now, in 2017? Because there are more choices than ever before. Our ability to reach people has never been greater, and average customer is inundated with buying decisions that they need help with. Twenty years ago, a salesperson was really limited to the audience that they could reach within a 10-mile or 20-mile radius. Now, it's truly global. The average salesperson can now reach an audience three, four or five times the size they could then. Our ability to create opportunities, and the availability of tools with which to reach people, has never been greater. It’s easier to prospect today than it's ever been, because of things like social media, because of the worldwide web. There's just so much information out there about people that I can create relationships with people that I never would otherwise be able to contact with. That jazzes me. That excites me. That makes it fun. In the last 20 years, what are some of the most surprising things you've seen in the sales industry? Twenty years ago, you could make one phone call to a prospect, and you could probably get an appointment and a meeting. Today, that's just not going to happen. You have to make multiple calls. You have to demonstrate value over multiple appointments — whether it be on the phone, whether it by way of email, whether it be by way of social media — to earn yourself the right to have that appointment. It's a much more competitive landscape out there because the customer is so inundated from a time standpoint. The flip side is, that 20 years ago, there would be a lot of potential customers that would have a meeting with a salesperson just to explore your product. Those meetings would never go anywhere because the salesperson was providing to information that today, the customer would get on the Internet. My goal is now only to blow it up, expand it, ensure it's right and craft the right solution to help you solve your problem. What changes have you seen in last 20 years that transformed the sales industry? Entry level artificial intelligence, automated ordering systems, automated invoicing, and automated supply chain management, have replaced numerous traditional account management type roles. It's all handled by computers speaking to computers. That's probably been the biggest change. It's a good thing because it's made it us all more efficient. I look at it like this: anything that allows us to be more efficient as a salesperson makes us better salespeople. But good or bad, it's here to stay. When you're standing in front of your audiences, do you ever see young people who are in that stage of their career you were in when you started with Petchl’s? Reps who might be in sales, but not love it yet? I see those people all the time. They come up to me afterwards and they say, "Thank you, because I was looking to check out of sales." People have this impression that sales is slimy and scummy, and salespeople are out to rip people off. As much as I teach about the process of selling, it really isn't that. It's not what you sell. It’s not even how you sell. It's why you sell. Why do you sell? To make a difference in the lives of people you come in contact with. Sales is a noble profession. Too many people think it's not, but it is.